In 1990, a teenage Gary King and his four friends attempt a legendary pub crawl in home town Newton-Haven known as The Golden Mile, not reaching the final of the 12 pubs, The World's End. 23 years later, a now adult Gary King, suffering from alcoholism, tracks down his four friends, and convinces them to re-attempt the same plan. A few pubs in, Gary gets into a fight with a teenager, unintentionally revealing some of the locals as robots, and soon the five friends come to realise that a lot has changed since they left in 1990. The well known "Three Flavours Cornetto" trilogy is an odd trilogy, as none of the films are actually connected in any way, with the exception of repeated jokes and themes. The World's End closes this trilogy with a bang. I'm not a huge fan of Shaun of the Dead, but Hot Fuzz is a truly exceptional film, which would be tough to beat. Whilst The World's End doesn't quite reach the humour levels of the latter, it is still very, very funny, and still manages to present emotion, moral and a few genuinely touching moments. This time around, the roles are reversed. Whilst we're used to seeing Nick Frost play the bumbling idiot while Simon Pegg takes the more sophisticated role, this has been changed up for The World's End. This, in itself, was a brave move; spontaneously changing a brilliant formula is not always a good idea. Here, it sort of works. Pegg carries this film from beginning to end. Frost is still entertaining, and all the acting is particularly impressive, but by being overly serious, he is wasted for the first half of this film. His character does nothing but sit and moan. It's nice to have a change up, but this is not the Nick Frost we've grown to like through the trilogy. The supporting cast are all welcome too. Martin Freeman is brilliantly energetic as Oliver (or O-Man), Paddy Considine plays hopeless romantic Steven with style and emotion, and Eddie Marsan is vulnerably likeable as Peter. Much like Hot Fuzz and Shaun of the Dead, the surrounding members each have their own personality traits, making each character feel so much more rounded, and well developed. Undeniably, Pegg and Frost are the stars here, and not once does the film forget that, but this is probably the best supporting cast of the trilogy. The script is also very strong, both with humour and emotion. 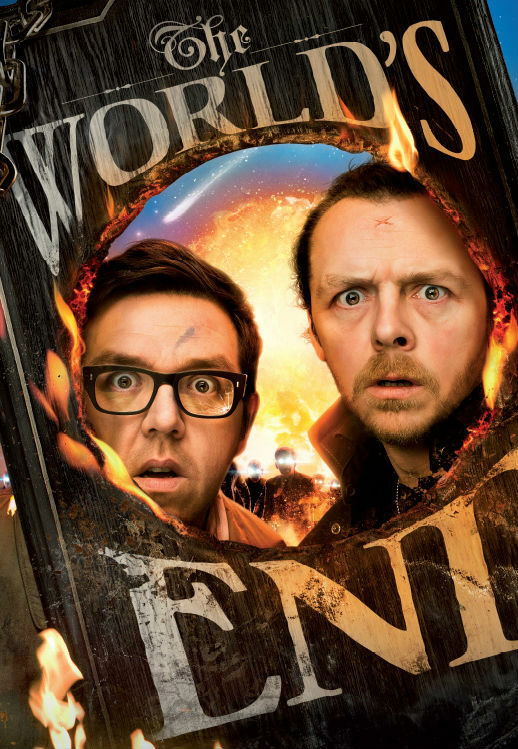 The World's End may not be as funny as other Pegg/Frost efforts, but it's still one of the funniest films of the summer. Had other recent apocalyptic comedy This Is The End not been released this year, you'd be hard-pressed to find anything funnier. Jokes are reused, but they remain just as funny each time around. Metaphors are commonly used, as is the simplicity of fast paced dialogue. For the most part, this really is an a-laugh-a-minute kind of film. But, as the film reaches it's final moments, there are some genuine, heartfelt moments. Whilst Shaun of the Dead brings themes of family, and Hot Fuzz community, The World's End is essentially a tale of friendship, and how no matter how hard you try, everyone goes their own ways. One line in particular, as Gary and Andrew fight in the final pub, really hits home, and the ending is ringing with the heart and emotion we've come to expect from this trilogy. In general, The World's End is a very strong film. It doesn't live up to Hot Fuzz, but in itself, it works. There are patches where the laughs start fading, and the film itself is completely mental, but it's undeniably entertaining, and the 110 minute run-time flies past. It may not be the funniest of the trilogy, or the most original, but it is the most human. The development of Gary King is faultless, and despite his insane stupidity, it's difficult not to care about him, and grow to love his relentless sense of fun and hope. This may not be the best of the trilogy, but with themes of friendship, love, alcoholism and nostalgia, it is, in many ways, the most powerful. 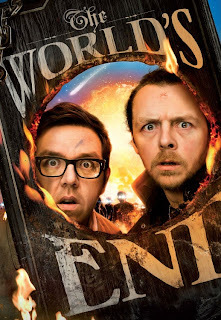 To Summarise: With big laughs, a strong script, powerful emotion and an able supporting cast, "The World's End" is another flying success for Pegg and Frost.